Will YOUR Hypnotherapy Trainer remember Hypnosis comes from the Ancient Egyptian Sleep & Dream Temples? Will they be a Certified Master Trainer of Hypnotherapy plus be trained by many of the Best Hypnosis Trainers in the World? Only Elisabeth Jensen offers you this innovative training so you can become the VERY BEST Hypnotherapist. So WELCOME you are in the right place to remember your own true power to heal and offer hypnosis to all those seeking to remember and recreate their own perfected Mind, Body and Divine Soul. Holistic Hypnotherapy has been approved by IMDHA as a new Specialty Certification Modality that is taught by Elisabeth Jensen to qualify students who complete the Diploma of Holistic Hypnotherapy both as Certified Members of IMDHA plus for IMDHA Certification in Holistic Hypnotherapy. Training in Auset Temple Healing Level 1 is included in this accreditation as it originated in the the Ancient Egyptian Sleep Temples of Hypnosis. TRAIN WITH ELISABETH JENSEN, a highly experienced Registered Hypnotherapist with a Diploma of Hypnosis & NLP plus a Certified NLP & Hypnosis Trainer with ABH plus additional training as a Dave Elman Best Practices Hypnosis Trainer plus a Certified Master Trainer with IACT. Her Hypnosis School - Centre For Complementary Healing Studies- is an Approved Hypnosis Training School with IMDHA - International Medical & Dental Hypnosis Association plus IACT -International Association of Counselors and Therapists and Elisabeth is also a Certified Master Trainer with them as well. Elisabeth is as gifted Medical Intuitive, Psychic & Trance Healer, Medium & Mesmerist & founder of Auset Egyptian Temple Healing. With a true understanding of deep trance states Elisabeth can then assist you to access them easily yourself for both self hypnosis and with clients. Students find her courses life changing & many experienced healers remark they have improved their practice dramatically since training in hypnosis with Elisabeth. HYPNOSIS is a modality that has scientifically been proven to be effective in managing certain behaviours such Over Eating & Smoking & has been extensively used by the many Medical Doctors including those trained by Dave Elman for pain management and even surgery without anesthesia.& Milton Erickson MD for management of emotional disorders. Through the case studies & books of Dr Briann Weiss MD & Dolores Cannon Past Life Regression has been proven to be of immense benefit with many clients also. Elisabeth has many years experience in Clinical and Holistic Hypnotherapy with clients and offers regular group Ancient Egyptian Sleep Temple Hypnosis with amazing healing results. Elisabeth is a Master Hypnotherapist plus a Master NLP Practitioner & Coach, Master Time Line Therapist TM. She first trained with Brad Greentree & Drs Adrianna & Tad James in both Australia & USA. Elisabeth also later trained in USA with Larry & Cheryl Elman as a Dave Elman Best Practices Hypnosis Trainer and with George Bien in USA as a Certified Master Trainer. Elisabeth also completed Coaching the Unconsious Mind with Melissa Tiers from New York and is Certified Integrative Life Coach plus completed Quantum Healing Hypnosis Levels 1 & 2 with Dolores Cannon in 2011. She also previously trained with a number of other teachers including Denise Linn in Past Life Regression Therapy and also trained in The Tibetan Buddhist System for reaching the Bardo State safely after death. Elisabeth first trained as a Registered Nurse & Midwife plus has a Diploma of Community Health Nursing specialising in Family Therapy & Addictions Counselling so brings all these many skills to your training. Elisabeth is a Member of the International Medical & Dental Hypnosis Association plus a Certified Approved Instructor with them Registration #172606 and a Member of International Association of Counselors and Therapists plus a IACT Master Trainer with the Registration ID #-CMT-0517-18. Also a Registered Hypnotherapist & Certified Hypnosis Trainer with The American Board of Hypnosis plus NLP Trainer through American Board of Neuro Linguistic Programming. Elisabeth Jensen is Principal of an Approved School of Hypnosis with American Board of Hypnotherapy so optional International Certification is also available to graduates of the Holistic Hypnosis Practitioner Course. Certification for this level is given also through Dave Elman Hypnosis Institute. NB! Student Certification for Holistic Hypnotherapy Certified Practitioner, Master Practitioner Holistic Hypnotherapy plus Diploma of Holistic Hypnotherapy highlights Elisabeth Jensen as Principal of Centre For Complementary Healing Studies rather than Auset Temple Healing so as to be more suited for practitioners working in Professional Health Care settings. The Certified Holistic Hypnotherapy Practitioner Certification Course is accepted by International Institute of Complementary Therapies so students can easily access Insurance & Professional Indemnity for their Hypnotherapy Practice through them. Elisabeth is also an Executive Members of IICT. Students who complete the Diploma of Holistic Hypnotherapy can also become Certified Members of IMDHA and/or IACT if they wish. FREE STUDENT MEMBERSHIP OF IMDHA is now given to all new students ( Value US$69) so they have a very valuable FREE Resource of Videos, Scripts and Podcasts available to assist with their studies - click International Medical & Dental Hypnosis Association Logo below to visit their website. Two Certificates will be given -the first as a Holistic Hypnotherapy Certified Practitioner plus in Dave Elman Best Practices Hypnosis- with Certification from DEHI in USA for this one. Book here! For these Seven Day Intensive Courses, taught by Elisabeth Jensen only in Adelaide. A comprehensive course especially designed to suit Health Care Professionals, Nurses, Healers, Psychics, Counsellors and Life Coaches or simply those seeking to learn Hypnosis to help themselves. Includes FREE Student Membership of IMDHA so you have a valuable online resource available for future study and practice. We utilise the course manuals and curriculum from IMDHA and IACT Hypnotherapy for this course. Plus includes 3 days of Dave Elman Best Practices Medical Hypnosis training including the very deep Esdaille State and Age Regression also Rapid and Instant Inductions. Plus basics of Ericksonian Hypnosis for Clinical Practice -often called Conversational Hypnosis as you can also use it informally during Healing & Psychic Consultations to create rapport with clients. PLUS includes Introduction to NLP plus Mesmerism or Energy Hypnosis to create rapid & deep trance states & relaxation plus additional healing for your client. This is wonderful for practitioners in clinical settings such as hospitals to manage to rapidly calm stressed & agitated clients. Elisabeth has previously taught Therapeutic Touch to Nurses & Health Care Professionals for 24 years & has much experience in teaching Energy Medicine. An extra advantage is an energy clearing & attunement for each participant by Elisabeth so they can enter deep trance states easily plus automatically channel healing energy during treatments. This is unique to Elisabeth's courses. Clinical Hypnosis Includes Stop Smoking, Ideal Weight Management, Pain Management, Stress Management & Self-Hypnosis. Plus an introduction to NLP. There are no prerequisite courses to this 7 day training course that will teach you all the basics requirements & much more to become an effective & Certified Hypnotherapist in Australia. When you are ready the advanced level courses will also enhance your skills. The Art of Hypnosis by Roy Hunter - please purchase & read this one before the course. Hypnotherapy by Dave Elman. Available to purchase at the course ( cheaper option) or from book stores such as Amazon and Book Depository. BOOK YOUR COURSE & BECOME A HOLISTIC HYPNOTHERAPIST! Become a Certified Master Holistic Hypnotherapist in this 7 day advanced level course. Incorporating a Client Centred Approach to Hypnosis that heals the Body, Mind, Spirit & Soul of your clients. Prerequisite Course: Certified Hypnotherapy Practitioner 4 Day Course plus the 3 day Dave Elam Courses OR the new 7 day Certified Practitioner of Holistic Hypnotherapy. Includes advanced Ericksonian Hypnosis, plus the deep trance phenomena of Estabrooks. Includes advanced hypnosis for Weight Management including Elisabeth's own highly effective process for Energy Gastric Banding with the Spirit Doctors, Age Regression Hypnosis to determine the cause of an emotional difficulty plus to before Birth, in the Womb & just after birth plus Hypnoanalysis for healing insights also Parts Integration for Personal Problem Solving. Also Rapid & Instant Inductions, Waking Hypnosis & more Mesmerism to make your hypnosis treatments so much more effective. Spiritual Hypnosis is included to assist clients to connect with their Higher Self & receive Guidance, plus the process for Spirit Releasement Therapy. This is a truly Holistic & very powerfully effective approach to Hypnotherapy that incorporates communicating with the Body, Consious Mind, Unconsious Mind and Higher Self of clients. This Training puts it all together to make you a truly professional Hypnotherapist! Prerequisites: 7 Day Certified Practitioner & 7 Day Master Practitioner of Holistic Hypnotherapy plus Auset Temple Healing Level 1 OR PREVIOUS 4 Day Hypnotherapy Certification Course, 8 day Master Practitioner Intuitive or Holistic Hypnotherapy & Auset Temple Healing Level 1. Plus required prior reading and practice sessions with clients. Learn advanced Hypnosis techniques plus all the skills to become a Professional Hypnotherapist including setting up your own business. Includes interviewing and Counselling Skills, understanding and assessing clients with emotional and mental health disorders and addictions plus when to refer clients out, treating PTSD, Sexual Disorders, Dream Analysis using Hypnoanalysis plus advanced Age Regression for treating many disorders and Parts Integration for Personal Problem Solving. Spiritual Hypnosis to connect the clients to the healing wisdom of their Soul is of course included plus Creative Hypnosis so you are always able to assist clients. Plus The Art of Hypnotic Hypnotherapy & Spiritual Hypnosis Hypnosis both by Roy Hunter Please read at least The Art of Hypnotic Regression in advance of the class please. Total Class room hours with all levels =184 with Home Study, Practice & Online of 116 hours = 300 hours in total study for your Diploma of Holistic Hypnotherapy. Successful students will be able to become Certified Members of IMDHA and/or IACT . FAQ - PLEASE DO READ! This is a Diploma in Holistic Hypnotherapy NOT a Diploma of Clinical Hypnotherapy. It is designed to suit those wanting a more intuitive, holistic and spiritual approach to Hypnotherapy to combine with energy healing modalities and Past Life Regression. While you should be given credit for at least 100 hours if you complete the first 7 day course by Australian Hypnosis Associations such as AHA plus anther 100 hours if you complete the Master Practitioner of Holistic Hypnotherapy, it is not designed to lead to Professional Membership with them which usually requires about 500 hours. You can join American Board of Hypnotherapy of course for International Certification after completing the 7 day course plus IMDHA after completing your Diploma of Holistic Hypnotherapy! ABH requires 100 hours of training and IMDHA and IACT requires minimum 220 hours training to join as a Certified Hypnotherapist. Elisabeth encourages you to research the benefits of having a Provider Number as a Hypnotherapist in Australia before you commit to an expensive training for this reason- as many Health Funds will only pay benefits if you are a Registered Psychologist providing Hypnotherapy services. Hypnosis is deregulated in Australia. There is no governing body you need to join to practice as a Hypnotherapist and although its great to be a Member of supporting organisations of course, do know your success as a hypnotherapist in private practice is dependent mostly upon YOUR skills as a Practitioner. Insurance and Professional Indemnity Coverage can by obtained by joining International Institute of Complementary Therapies through an agreement Elisabeth has with them for her hypnosis students to be covered through their Insurance Provider - both for the Practitioner and Diploma Level. Many Health Care Professionals study with Elisabeth and have used their Certificates from Centre For Complementary Healing Studies as CPD Hours within their respective organisations. THESE COURSES REQUIRE PRIOR ATTENDANCE AT AUSET TEMPLE HEALING COURSES AS WELL AS HYPNOTHERAPY. Very advanced Hypnotherapy and Dream Hypnoanalysis as practised in the Temples of Ancient Egypt in this 2 day course. 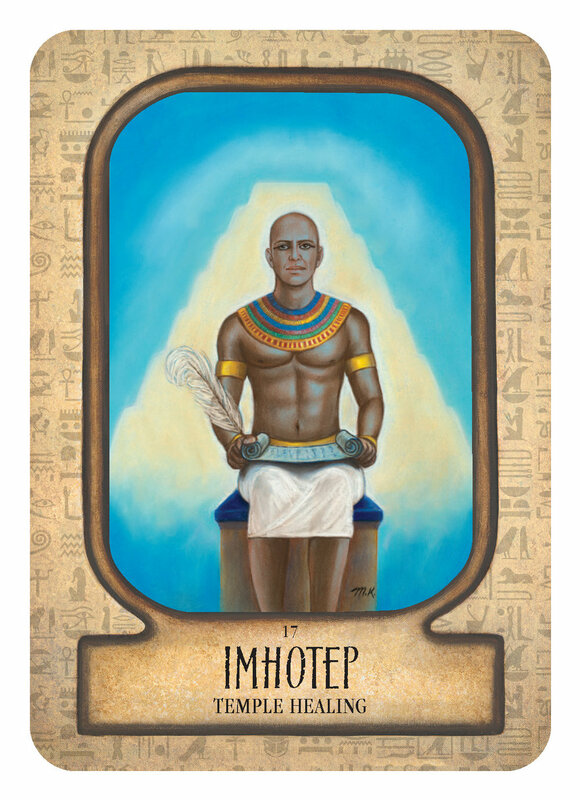 This course is overseen by the God Imhotep who takes clients into a very deep hypnotic state for rapid healing. Become a true Alchemist! Includes Auset Healing Hypnosis plus Sacred Anointing using Essential Oils. You will also be able to offer Auset Egyptian Sleep Temple Hypnosis to Groups. PREREQUISITE COURSES: Diploma of Holistic Hypnotherapy, Auset Temple Healing Level 3, Auset Temple Trance Channel plus Past Lives Regression Alchemist. Combining the work of modern Hypnotherapy plus Healing in The Halls of Amenti with the Ancient Divinities and Egyptian Temple Priests & Priestesses this course is Elisabeth Jensen's own creation & channelled information. Please see http://www.elisabethjensen.com.au/yl-essential-oils for more details of the essential oils used in this course. Become a highly trained & skilled Past Life Regression Practitioner also able to connect clients to the highest part of their soul for valuable and often amazing information & profound healing. By completing Auset Healing Level 2 course as well you will be able to read the clients Akashic Records to give them past life regression readings plus highly effective Karmic Release for Past Life concerns. This you will become an expert in understanding Past Lives plus be able to offer clients the best way to deal with these issues. These Hypnosis Sessions take 3 - 3.5 hours and are deeply & often amazingly healing. Prerequisite Courses: Hypnotherapy Practitioner Certification Training plus Dave Elman Hypnosis Training OR the new 7 Day Certified Holistic Hypnotherapist Training Auset Temple Healing Levels 1 & 2 plus Auset Temple Divination. Completing Angel Miracles Psychic Mediumship Training is also essential for learning Spirit Releasement Therapy first plus understanding the Souls Journey through Life & Death. Train to take clients into their time in The Light or often called Lives Between Lives or to visit Loved Ones in The Light. You will be able to take clients on both long & short Journeys into The Light to meet their Wise Council and loved ones plus receive much information & healing. Includes Regression into childhood & the womb. This course is for 4 days & requires the Diploma of Holistic Hypnotherapy plus Past Lives Soul Alchemist also Auset Temple Trance Channel, Angel Miracles Psychic Mediumship plus Auset Temple Healing Level 3. The full Life in The Light Session lasts for 4 - 5 hours in total and the short Journey for 60- 90 mins in total. While still working as a Registered Nurse in Palliative Care in 1995 Elisabeth trained with a Tibetan Buddhist Monk to prepare & take first herself then later clients safely into The Bardo State & The Light. Since then she has assisted thousands of clients to first visit The Light then later Cross Over & Live Within The Light or just go there for a short or extended visit for healing or spiritual insight. Course is for 4 days. Next available November 28 - Dec 1 2019 in Adelaide.